There are several equine career options that offer an average salary of at least $50,000 per year. Farriers (also known as blacksmiths) provide comprehensive care for the equine foot, including regular maintenance and addressing any problems that develop. 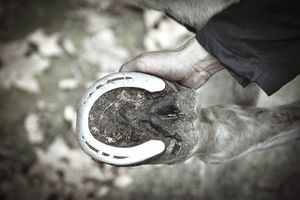 The usual duties for a farrier include trimming, shaping and applying shoes, and evaluating potential causes of lameness. A farrier’s salary varies based on the number of horses he works on per day. A 2011 survey from the American Farriers Journal reported that the average salary for experienced, full-time farriers was $92,600 (up significantly from the 2008 average salary of $80,000). Equine veterinarians provide comprehensive health care services. These services usually include routine performing health exams, giving vaccinations, providing emergency care, and conducting pre-purchase exams. According to the American Veterinary Medical Association, the average salary for newly graduated large animal veterinarians is $64,744. The average salary for established equine practitioners is $85,000. Board certified equine specialists could earn much higher compensation, easily pulling in salaries in the six-figure range. Equine pharmaceutical sales representatives market drugs and related health products to equine veterinarians and veterinary clinics. Sales representatives may either work from an office (“inside” sales) or travel to call on potential clients in person (“outside” sales). The salary for pharmaceutical sales reps usually includes some combination of base salary, commission on sales, use of a company car, bonuses, and benefits. According to Payscale.com, the compensation for veterinary pharmaceutical sales reps ranges from $59,000 to $120,000 depending on sales volume and level of experience. Equine dental technicians are primarily responsible for floating teeth (filing down sharp enamel points) during yearly dental exams. They also must be able to identify emerging dental problems and take measures to prevent these issues from developing further. The salary an equine dental technician earns can vary depending on how many horses the tech treats per day. Most equine dentistry schools report that their graduates earn salaries greater than $50,000 per year. In September 2011, SimplyHired.com reported equine dental technician salaries ranging from $69,000 to $76,000. Mounted police officers patrol areas on horseback to enforce laws and provide crowd control. The Bureau of Labor Statistics does not provide details on the earnings of mounted police officers, but the average salary for all police officers was $53,540 in a 2010 survey. Members of the mounted unit may earn slightly higher salaries because specialty skills are required for this line of work. Livestock feed sales representatives market feed products to equestrian centers, breeding farms, and race tracks. Most positions require significant travel, as the representative tends to visit these equine businesses in person to evaluate their needs and negotiate sales. The salary for a livestock feed sales representatives often includes a combination of base salary, commissions, bonuses, and use of a company car. According to the Bureau of Labor Statistics, the median salary for livestock feed sales representatives was $70,200 in May of 2010. The exact salary a rep earns can vary widely based on the volume of their sales. Product sales representatives market a variety of equine products to retailers and equine businesses. Companies manufacturing equine products such as supplements, saddles, specialty fencing, stable equipment, grooming products, bits, treats, or blankets may have sales reps on staff to represent their interests. Product sales rep positions exist in both “inside sales” and “outside sales,” but the majority of positions involve at least some travel to visit clients or participate in trade shows. Compensation for a product sales rep is usually composed of a combination of base salary, commissions, company car, and bonuses. According to the Bureau of Labor Statistics survey, the median salary was $70,200 in May of 2010. Of course, the salary can vary based on sales volume and experience. Equine insurance sales agents offer insurance policies to horse owners. While some insurance agents offer exclusively equine policies, most agents also sell other types of property and casualty insurance as a part of their portfolio. Compensation for equine insurance sales agents may be a combination of base salary, commissions, and bonuses. While the Bureau of Labor Statistics does not separate equine insurance agents into a separate salary survey category, the more general category of all insurance agents had an average salary of $62,520 in the most recent (May of 2010) survey.